November 17, 2015, 7:00 P.M.
Switzerland's Official Submission for the 88th Academy Awards. In Theatres on Friday, November 27th, 2015. Tracing the emigrations of his family over more than half a century, this riveting documentary epic from acclaimed expatriate Iraqi filmmaker Samir pays moving homage to the frustrated democratic dreams of a people successively plagued by the horrors of colonialism, dictatorship, war, and foreign occupation. While there are no precise statistics, it is estimated that four to five million Iraqis live outside Iraq today. Award-winning filmmaker Samir was born in Baghdad and has lived in Switzerland since he was child, while the members of his extended family are scattered all over the world — Abu Dhabi, Auckland, Sydney, Los Angeles, Buffalo, London, Paris, Zurich, and Moscow — with only a handful remaining in Iraq. Recounting his family’s stories of departures and uprootings, in Iraqi Odyssey Samir also chronicles how Iraqis’ dreams of building a modern and just society after their nation achieved independence in the 1950s were brutally dashed over the course of half a century. Loosely organized in three acts, the film begins with Samir’s grandfather and his role in the struggle against British colonialism. The second act traces the successive waves of emigration as his relatives sought safe havens around the globe to escape from the series of coups and counter-coups in the 1960s and 1970s that resulted in the establishment of Saddam Hussein’s three-decade dictatorship over the country. Saddam’s deposition by the 2003 US invasion, and the iconic image of his statue being toppled in Firdos Square, signals the film’s final act, and the last tale of departure. 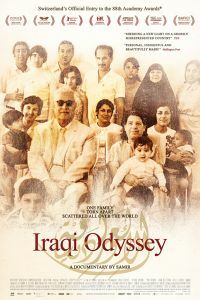 Weaving together the ironic, wistful, and witty testimonies of Samir’s relatives with rare documents from private and state archives, and Ottoman film footage, Iraqi Odyssey is a riveting epic that creates a genuine people’s history of Iraq, at once humble and majestic. Shedding a new light on a grossly misrepresented country, Iraqi Odyssey is the veteran director’s most personal, ambitious, and accomplished feature to date. Provided courtesy of Typecast Films. Rated R. Running time: 163 minutes. In Arabic and English, with English subtitles. 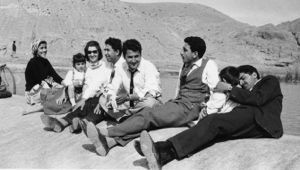 I spent my childhood in the Baghdad of the 1950s and the early 1960s. The whole family, my parents, my grandparents, all my aunts and uncles lived all together in a big house in a new residential quarter, like a typical middle class family at that time in Iraq. My grandfather was an expert in Islamic law and he worked as a judge. My grandmother went to the mosque very often and took me along with her. However, I grew up with Tchaikovsky, Beethoven, Shakespeare and the modern sciences and of course the Arab classics and the singers Fairuz and Umm Kulthum. Early on, my father, my aunts and my uncle told me about the rest of the world; I knew that the world was round and that there was a country called «Suizra» (Switzerland). That’s where my mother was from. When we came to Switzerland, I was still a kid. As a schoolboy, I was irritated by the fact that I knew many European artists while my classmates didn’t know anything about the Arab world. At best, they confused Iran with Iraq. At that time it never struck my mind, that this euro-centrism was based on a system, and that it had nothing to do with whether people where intelligent or stupid. Later on, when the rest of my aunts and uncles still were living in Iraq and I came to visit them, we used to make fun of the ignorant western people. In 2003, the invasion of the U S troops wiped that smile off our faces. Now, my family lives scattered all over the world. From Abu Dhabi, Auckland and Sydney to Los Angeles, from Moscow, Paris, Zurich and London to Upstate New York: we belong to the 4-5 million Iraqis who do not live in their home country anymore. Like many other Iraqi middle -class families, we’ve become a globalized family that has become integrated into the western society without any difficulty. How did it come to this, that all our dreams of a renaissance in the Arab world and the wish for a transformation into a modern, just society were so abruptly and brutally destroyed? Is there a possibility to reconstruct this dream by building on our experiences of migration? Iraqi Odyssey shall tell this story. Born in 1955 in Baghdad, Iraq. Migrated with his family to Switzerland in the 60s. After studying at the School of Arts in Zurich, apprenticeship as a typographer. In the late 70s, training as a cameraman. Activist in the radical youth movement in the early 80s in Zurich. First works as freelance author and director in 1982. Today Samir is well known for his unique fiction, documentary and expe - rimental films, whose innovative character drew attention at various festivals and won numerous awards. His work to this day encompasses more than 40 short and full-length feature films for cinema and television. In the 90s he also worked as a director for national and international broadcasters. In 1994 he took over Dschoint Ventschr Filmproduktion with filmmaker Werner Schweizer and producer Karin Koch. Based in Zurich, it builds up new Swiss film talents. Beside his own projects as an independent producer and director, he regularly directs theatre plays and works in the field of visual arts. 2013 Iraqi Odyssey, documentary, 3D/ H D/16mm, 162 min. 2010 The Train Station and its Angel, documentary, H D, 52 min. 2005 Snow White, feature, 35mm, 120 min. 2002 Forget Baghdad, documentary, 35 mm, 110 min. 1998 Projecziuns tibetanas, documentary, video, 24 min. 1997 Angelique, short, 35 mm, 10 min. Outside the Box [Office] is a weekly showcase for upcoming releases highlighting world cinema, documentary and independent film titles. Recognizing a need for greater diversity on campus, the series will draw from around the globe to present movies that may challenge, inspire or simply entertain. To view the calendar of screenings, click here. This screening is free of charge and open to the public. Please bring a valid USC ID or print out of your reservation confirmation, which will automatically be sent to your e-mail account upon successfully making an RSVP through this website. Doors will open at 6:30 P.M.
All SCA screenings are OVERBOOKED to ensure seating capacity in the theater, therefore seating is not guaranteed based on RSVPs. The RSVP list will be checked in on a first-come, first-served basis until the theater is full. Once the theater has reached capacity, we will no longer be able to admit guests, regardless of RSVP status. The USC School of Cinematic Arts is located at 900 W. 34th St., Los Angeles, CA 90007. Parking passes may be purchased for $12.00 at USC Entrance Gate #5, located at the intersection of W. Jefferson Blvd. & McClintock Ave. We recommend Parking Structure D, at the far end of 34th Street. Metered street parking is also available along Jefferson Blvd.